The body of the policeman washed away by the flooded Tapo River in Madang, province has been found. Late Officer Clement Vilau, aged 34 from Kokopo in East New Britain was found buried in mud and a pool of water along the Naru River on Saturday. 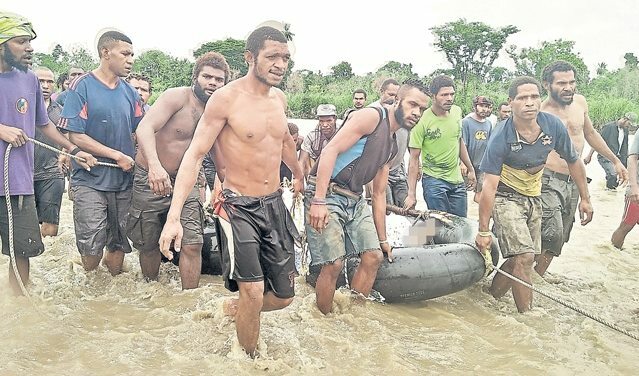 Vilau was in the company two other officers, the Task Force Commander of Madang, Senior Sergeant Willie Marita and Justin Baugen when the ten-seater vehicle they were traveling in got swept away by strong currents at Tapo in December. Officer Baugen had survived the ordeal while Marita and Vilau succumbed to the raging river. Madang police have been combing the Tapo, Naru and Gogol rivers for Vilau's body for exactly a month and one day before discovering Vilau. Vilau’s body is now being kept at the Modilon Hospital mortuary awaiting repatriation to East New Britain. Meanwhile, Director Medical Services at Modilon General Hospital, Dr Vincent Atua has advised family members, colleagues and relatives against the idea of moving the body to a funeral home for some time. Dr Atua says due to the appalling state of the body, they will not get the desired results, and advised on preparing the body for burial. Acting Provincial Police Commander, Senior Inspector Jacob Bando could not be reached for comments. The late Marita’s body is still in the Funeral Home in Lae. Both men will be repatriated to East New Britain.